When it comes to CRO and optimization in general, we’re constantly thinking about how to grow our numbers and scale the business. Using various techniques and tools, we push forward to acquire more customers and generate more revenue. So, it’s great that businesses want to generate more revenue and grow, but customers don’t really care about that. There are many competitors out there selling the same stuff and trying to grab their attention. How do you convince your visitors to invest in you? If your answer is “we have amazing features” or “we’re cheaper than our competitor”, allow me to stop you right there. You’re doing it wrong. Research done in the past 35 years shows that emotions “powerfully, predictably, and pervasively influence decision making” (Lerner et. al.). In fact, recently, neuroscientist A. Damasio studied individuals who had brain damage in the area that generates emotion. When asked, these people found it difficult to make even simple decisions, such as what to eat (pasta vs. a sandwich). The research highlights the fact that those who base their marketing on pure logic and reason are doomed to only go so far because they do not understand what truly motivates people’s decision making processes – emotion. Marketing, and CRO specifically, is more than just analyzing data and understanding online behavior or leaks in a funnel. It’s about understanding people’s decision making processes, and catering to emotional needs. Appealing to them on an emotional level and helping them rationalize their decision making process. It is our job as marketers to drive logic where emotion lays. When we buy something, we don’t purchase a “product”, a special price or features; we purchase an experience and a better version of ourselves. Many brands are trying to convert your customers, which is why before asking people to subscribe to your newsletter list, for example, you must have a clear strategy that shows customers exactly what’s in it for them. Why should they choose you over others? 1. Belonging – One of the most common and well-known strategies for signing people up to a service or a mailing list, for example, is giving people a sense of community and exclusivity. Humans are social creatures who love to feel like part of a group and customers often purchase products in an attempt to feel part of a specific group. Being around people who share our goals or care about the same stuff makes us feel more secure and happy about our decisions. Many companies invite visitors to join the family and receive exclusive personalized offers. Other variations include: “Join X amount of people”, “Join our exclusive mailing list to gain…”, etc. Creating a community – “Let’s wake up together” and “Join millions”. 2. Scarcity – This strategy capitalizes on “loss aversion”, an emotional trigger or cognitive bias that takes advantage of people’s tendency to prefer avoiding losses than acquiring gains. People just don’t want to miss out, so by letting potential customers know that they could be losing out on something special, you can increase signups dramatically. Examples include: “Don’t lose this last minute sale” or “Just 5 items left in stock” and “For 24 hours only”. 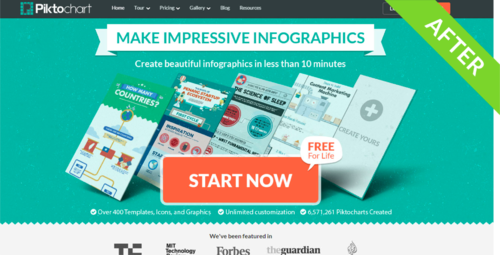 All these examples affect customers in a way that increases conversion rates. In fact, this bias is so strong that many people testify they buy products they weren’t even considering buying. 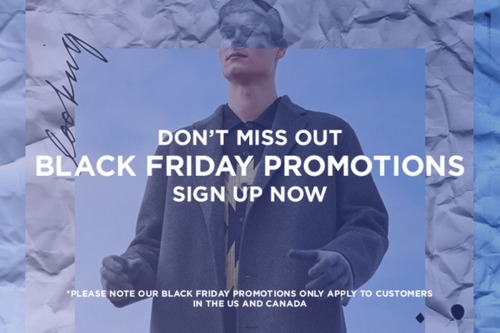 Exclusive Black Friday promotions for a limited amount of time – join now. The foundation of marketing is the process of identifying, meeting, and satisfying customer wants and needs. Whether it’s to feel part of a community or boost our self-esteem, everything we buy in life has an emotional reason to it. In order to meet customers’ needs, you must dig deeper and start testing different emotional triggers to identify what drives their actions. 1. Making it about the customer – The first (and most important) pillar of emotional conversion optimization is making all designs and strategies about the customer. Essentially it’s the difference between “This is what we do / this is our product / this is why we are the best” and “Here’s how your life is going to change for the better”. Making it about the customer is all about highlighting the customer’s personal benefit and value. 2. Show it, don’t just say it – It’s not enough to just tell people how their lives are about to change, you have to make them feel it. Our brains comprehend images far faster than text, which is why listing all your features and benefits won’t work as well as making people feel the value with your images, colors, and design. Take Piktochat for example (again). 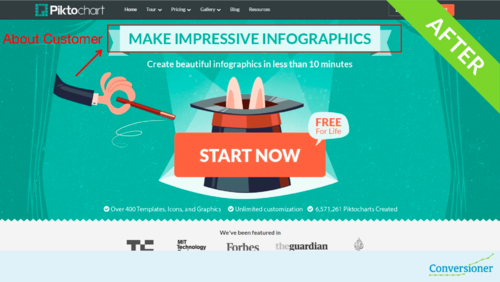 We don’t just say “Make Impressive Infographics”, we make people feel it’s as easy as magic with our main image. The second variation we created still featured the product, but the end result (the amazing infographics you could be creating). 3. Testing strategies vs. elements – For us A/B testing and conversion optimization have always been about acquiring more knowledge and getting to know our customers better rather than increasing a certain KPI. As a result of testing larger concepts and hypotheses, we achieve more meaningful results. This pillar refers to testing methodologies. Rather than duplicating a landing page and testing a call to action button or a title, start with a more strategic approach and then continue by narrowing it down into specific elements. Original: The company below states “Amazing Presentations in Minutes” and highlights the product as their hero image. 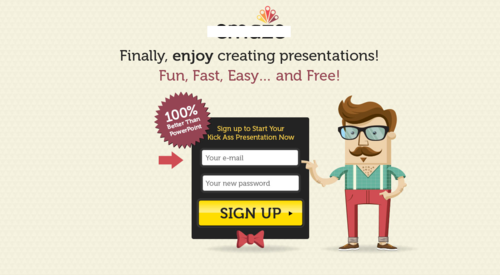 To make it about the customer, our hypothesis was that people have a hard time creating high quality presentations with PowerPoint and would really like an easy to use platform. We decided to avoid using technical terms and deliver a simple, clear message regarding the product in order to minimize friction and help users relate to it. Variation: “Finally, enjoy creating presentations!” Now it’s about the customer and their gain. We don’t just say it, we also use specific colors to enhance certain feelings of joy and anticipation. We use a hero shot of a cartoon marketer and tell them they’re about to deliver a “Kickass Presentation”. 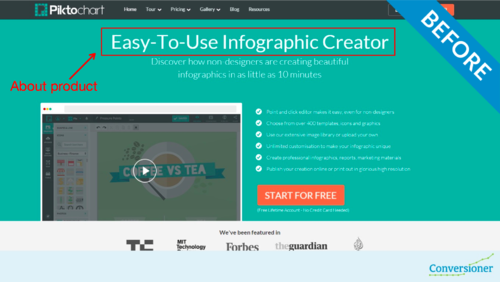 This variation increased signups by 316% and the creation of presentations by 114%. Our work does not end with making the sale. Retention is key for growth and higher revenue, which is why you should be aware of the cognitive biases that affect your customer’s decision making process. Cognitive biases are “glitches” in our brain that influence us in a way we aren’t necessarily aware of. Below are just a few of the biases your customers may be experiencing and some suggestions for how to tackle them for higher retention. 1. Cognitive Dissonance: There is a timeframe between purchasing a product or a service and receiving it (or seeing its value) that consumers start second-guessing their decision. You may recognize this feeling from restaurants. Ever ordered something to eat and as you’re waiting for your own meal, see somebody else’s and question your original order? This happens many times with products that are purchased online and are not received on the spot, and with services (e.g. SaaS) purchased online if it takes a long time to get to the value. eCommerce emails: “Your package is on its way.” Supplying the current location of or an ETA on the package will help increase anticipation. Progress emails: A great way to keep customers happy and engaged is allowing them to monitor the progress, showing them how far they have come along. Showing your customers reports, numbers and data on their achievements via your service is key for happier and more content customers. Gamification: People naturally want to succeed. We want to achieve our goals whether it’s as proof to ourselves or to others. Gamification helps people become more active and engaged with products and services. The offline world has been using it for years, from Girl Scouts trying to get another badge to grown men and women working hard to lose weight and gain points for it. This is why gamification works well for retention. Allow customers to set goals for themselves and achieve points for taking certain steps (e.g. filling in their profile, reviewing items, writing recommendations and sharing items). Once they get to a certain amount of points, offer a discount on their next purchase or a free gift. 2. Choice supportive bias: Generally speaking, we tend to think back positively on our purchasing decisions. We have a tendency to ignore faults or mistakes in our decisions. Though we may have bought something by chance or on a whim, once we’ve spent the money, we automatically rationalize why we did so. We like to think of ourselves as rational people that have common sense. In fact, this bias is so strong that if we discover a better deal / platform or service after our purchase, we will still convince ourselves we made the right decision. This is also known as post-purchase rationalization bias. To capitalize on this bias, you need to reach out to your new customers and create an ongoing relationship. Utilize email marketing campaigns and retargeting. 3. Status quo bias: We are creatures of habit. We prefer the familiar, the known and the trusted. Once we’ve made a purchase in one place, we’ve made a connection and know how it works. We know how long stuff takes and that we can trust this service. We’re already emotionally invested and prefer to stay, even if there’s a better bargain somewhere else. Emphasize trust and social proof on your landing pages and campaigns. Personalize your emails to create a sense of familiarity and strengthen your relationship. Get to know your customer better and push out content that’s relevant to them. 4. Hyperbolic discounting: Given two similar rewards, people show a preference for the one that arrives sooner rather than later. What this means is that you have to think of more immediate rewards for your customers rather than offering a large reward that seems hard to grasp. For example, a good way to utilize this bias is by offering a small, immediate coupon for a customer’s current purchase or taken action rather than a larger coupon for their next purchase. There are many other biases and emotional triggers that affect our purchasing decisions. No matter what kind of product or service you sell, the story that will resonate with your customer is not about your product. It’s about the person your customer wants to be and how your product can help them realize that dream. The key to creating meaningful campaigns and tests is tapping into those emotional triggers and focusing on your customer’s goals and needs, not your own. Use belonging and scarcity to demonstrate what’s in it for the customer. It’s all about them, so speak to them directly (e.g. “you”) and make a personal connection. Pictures speak louder than words. Show people how your product or service will change their lives. Emotional targeting is key to retention. Using cognitive biases, which affect decisions, you can influence how long (and frequently) your product or service is used. For more from Talia, check out GetUplift.co.